The Viewfinder is a great tool for identifying peaks in the Cascade & Olympic Mountain Ranges in Washington. The graphic depiction of the mountains and the clear labeling make this a great reference on a clear Northwest day! 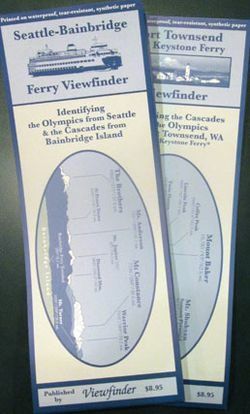 The Seattle-Bainbridge Viewfinder identifies the Cascades as viewed from Bainbridge Island, and the Olympics as viewed from the Seattle ferry terminal. The Seattle skyline is drawn as a ghost image as it location in respect to the mountains shifts throughout the ferry ride. The Port Townsend Viewfinder shows the same peaks as they are seen from a more northern perspective. One needn't ride a ferry to find this mountain reference useful. The only product of it's kind! Item Number Viewfinder Region / Size Price Qty.